There is wide range of evidence-based research support that Islamic Microfinance (IsMF) or interest-free microfinance is found to be instrumental to reach the marginalized and religiously observant Islamic poor. The scheme prohibits paying pre-determined interest. It intends to meet the financial needs of interested Muslim borrowers with microloan models and products that comply with the sharia law (not making interest) and addressing their quest for accessing finance in the fight against poverty. The scheme is meant to provide microfinance services in compliance and coherence with Islamic rules, moral values of social solidarity as it promotes the fact that money has no intrinsic value. Though there are documentations on IsMF in many regions of the world, little is written about it in the IGAD region and the Sub Saharan Africa at large. Therefore, assessing its state and legal/regulatory framework in the region is difficult due to data limitations. Nevertheless, some observations from the International Monetary Fund (IMF) and the World Bank (WB) reports as well as a few research work in the member countries indicated that there are large unmet demand for IsMF products given the large number of religiously observant Muslims, low financial inclusion and limited providers of the service. This study conducted by the Horn Economic and Social Policy Institute (HESPI) therefore bids to understand the growth trends of IsMF globally and in the IGAD region followed by analysis of available enabling legal and regulatory environment to promote the scheme in the member countries. 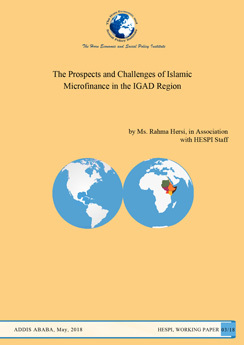 The report also tried to unearth key challenges hindering the thriving of the scheme and provides policy recommendations helpful to promote it in the IGAD context to support the regionalized fight against poverty and realization of the Sustainable Development Goals (SDGs) by way of creating more access to finance or microloans.